On March 30, more than 15,000 Palestinians protested along the Gaza Strip in what was referred to as the “Great March of Return,” one of the largest demonstrations in many years. The intended peaceful demonstrations quickly turned violent when a group of protestors near the Israel-Gaza border began to hurl rocks at the Israelis on the other side (The Guardian, “Palestinians say over a dozen killed in Gaza border protest,” 03.31.2018). The violence escalated when the Israeli army opened fire on the protesters, killing 17 and wounding at least 1,400 others, making it the deadliest Gaza protest in four years. Reportedly, 758 people were wounded by genuine ammunition while the rest was hit by rubber bullets or inhaled tear gas (Washington Post, Gaza toll rises to 18, Israel rejects excessive force claims, 04.02.2018). The protests continued through the weekend and into this week, but on a much smaller scale and are expected to last until mid-May when Israel celebrates its 70th anniversary and when the new United States Embassy will open its doors in Jerusalem (The New York Times, Israeli Military Kills 15 Palestinians in Confrontations on Gaza Border, 03.30.2018). Israel is denying responsibility and is pointing the finger at the Palestinian Hamas movement in Gaza. Israeli army spokesperson Ronen Maneli told reporters on Saturday: “What we saw yesterday was an organized act of terrorism.” Maneli went on to say that the Palestinians who died were terrorist activists. Meanwhile, Palestinian President Mahmoud Abbas also denies responsibility (DPA International, “Israel accuses Hamas of provocation after Palestinian protest,” 03.31.2018). The Israel-Palestine conflict has been ongoing since the middle of the 20th century. It began after World War II, when a growing number of Jews wanted their own country and were given Israel, which they considered their original home. However, this land made up a large part of Palestine and the Arabs who lived there and on nearby territories were angered by the redistribution of their land. 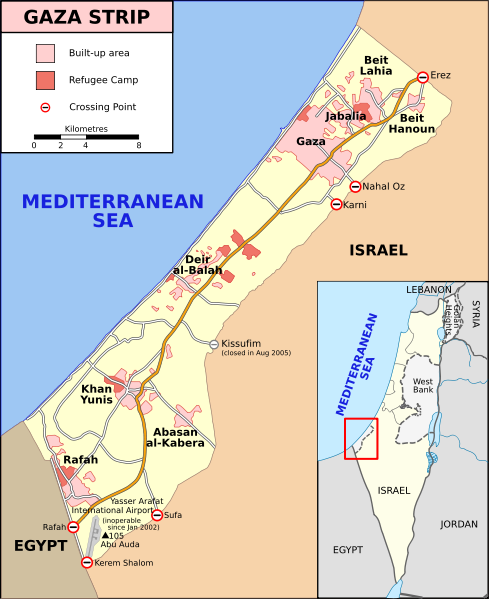 This led to conflict over the Gaza Strip, which is on the Israeli coastline and is home to over a million Palestinians. While the Israel-Palestine conflict goes beyond the control of the Gaza Strip, this issue is at the center of the conflict. This land has led to much violence throughout the past several decades (BBC, “Guide: Why are Israel and the Palestinians fighting over Gaza?,” 02.20.2015). Many of those living in Gaza are Palestinians who were forced off of their land in 1948 or descendents of those who lost homes after WWII, when the Jewish people were given Israel. It is believed that the largest turnout for a protest in years was due to the importance of the Gaza Strip itself as a central issue in the conflict. This remains a central issue due to the Israeli blockade of Gaza, which limits the movement of goods and people in and out of the territory (The New York Times, “Israeli Military Kills 15 Palestinians in Confrontations on Gaza Border,” 03.30.2018). The day of the protest itself also added to the conflict, as it took place on the anniversary of ‘Land Day.’ On this day, Palestinians remember and commemorate the day when Israeli forces fatally shot six Arab Israeli citizens during protests on March 30, 1976 that concerned the Israeli government’s seizing of land owned by Arabs. March 30, 2018 also marked the beginning of the Jewish holiday Passover, a time during which Israeli forces are on high alert (The New York Times, “Israeli Military Kills 15 Palestinians in Confrontations on Gaza Border,” 03.30.2018). The European Union called for an independent investigation into the use of ammunition. High Representative for Foreign Affairs Federica Mogherini stressed in her statement that freedom of expression and association is a fundamental human right that must be respected. Israel officially rejected calls for an independent investigation (The Guardian, “Israel rejects UN and EU calls for inquiry into Gaza bloodshed,” 04.01.2018) According to Israeli Defense Minister Avigdor Lieberman, Israel will not cooperate with any investigative commission. Israeli Prime Minister Benjamin Netanyahu praised the work of the troops in protecting the borders. In a statement to Israeli state radio, Defense Minister Avigdor Lieberman called an independent investigation hypocritical and stressed there would be no commission of inquiry (The Times of Israel, “Lieberman: Hamas march wasn’t Woodstock fest; calls for Gaza probe ‘hypocritical,’” 03.31.2018).